The actor Saigoku Hyôgorô I held this name from the beginning of the 1680s to the 12th lunar month of 1705. 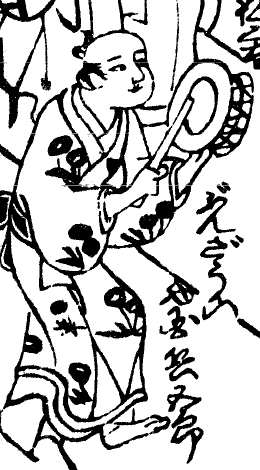 Saigoku Hyôgorô I in an ilustration from the book "Hana no Edo Kabuki Nendaiki"
Dates of birth and death unknown. Son of Saigoku Hyôgorô I, he took the name of Saigoku Hyôgorô II most likely in 1706. Just like his father, he performed in Edo as a dôkegata actor. He played in the 11th lunar month of 1719 at the Nakamuraza the role of Benkei in the kaomise drama "Nyohitsu Taiheiki". He appeared on stage for the last time in the 1st lunar month of 1720, in Edo at the Nakamuraza, where he played the role of Danzaburô in the new year sogamono drama "Ichi Fuji Raihai Soga". 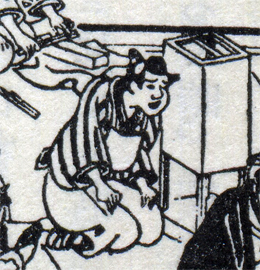 His rank in the 1720 Edo hyôbanki, dôkegata section, was jô-jô (superior - superior) [visual]. He shared the same rank with Tsuruya Nanboku I and Nanboku Magotarô II. No record afterwards. Dates of birth and death unknown. Disciple of Saigoku Hyôgorô I, he started his career in Edo miyaji shibai, peforming in the precincts of the Yushima Shrine or the Meijin Shrine. He received the name of Saigoku Hyôsaburô and performed as a dôkegata actor in the 11th lunar month of 1713 at the Moritaza in the kaomise drama "Yorimasa Taikyoku no Mato". 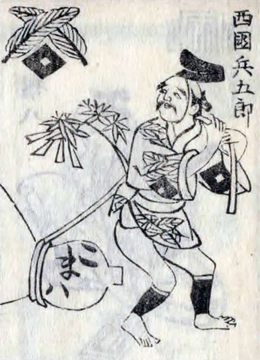 He took the name of Saigoku Hyôgorô III in the 11th lunar month of 1732 at the Moritaza, where he played the role of Bunzô in the kaomise drama "Ikioi Gongorô Kagemasa". He appeared on stage for the last time in the 11th lunar month of 1733, in Edo at the Moritaza, where he played the role of Abe no Seimei in the kaomise drama "Ebyôbu Shuten Dôji". His rank in the 1734 Edo hyôbanki, dôkegata section, was jô-(shiro)jô (superior - (white) superior) [visual]. He shared the same rank with Ichinoya Sagoshichi. No record afterwards.